The most beautiful beaches of Sardinia. The most beautiful beaches in SardiniaThe most beautiful beaches in Sardinia: as everyone knows, Sardinia is one of the best places to spend a holiday. Because ? Mainly because of its excellent climate, the clarity of the water and the wonderful breathtaking view that can be found here. In addition, the island can offer a dream vacation and here you will have the opportunity to really experience magical moments. You will surely remember this experience in Sardinia for a long time and will take it into memory whether you have spent your holiday with your family or friends. Tuerredda beach, for example, is rated by Tripadvisor as one of the region’s top 10 attractions, due to its white sand where you can sunbathe after a swim in the Mediterranean sea. If you like walking on the beach, 3 km away is Chia, another must-see place, since it is a coastal village with 4 km of beaches with golden sand, the same can be seen in all the films that over the years, famous directors have just been there. You can pretend to be a star and walk on the beach while everyone looks at you smiling. There are so many special beaches and features where you can relax and admire the crystal clear emerald waters, while you can drink a cold drink or an aperitif in the many bars in the surrounding area. Or, if you prefer, you can also rent a canoe or a pedal boat, have fun with your friends in the thousands of ways proposed in these places made just for fun and entertainment. If you prefer the area of ​​Cagliari, you can opt for the Poetto beach, since it is the longest in the area, it is in fact more than 7 km long! It is one of the surfer’s favorite places, and during the day you can rent rowing boats, windsurfing and all the equipment you need if you are a sportsman. What are you waiting to book your next vacation this summer? Do not waste any more time and book to go to Sardinia. 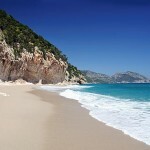 Which beaches are the best in Sardinia? Sport Trail event in Sardinia: save the date for May!